Bonaire has some 22 beaches. However, many of them are quite small, remote or not suitable for swimming. The two most popular beach experiences are quite different in character. Soroban Beach on Lac Bay is a busy, large size beach. It is well developed with a series of bars and restaurants along the beach front. The lagoon is protected by a barrier reef so the waters are shallow and warm. 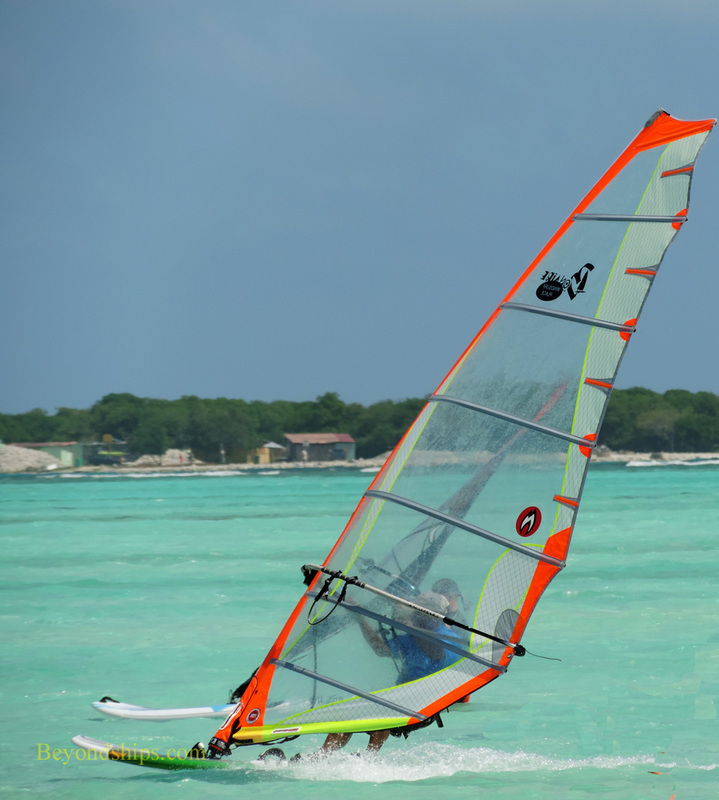 In addition to being a venue for sunbathing and swimming, this beach is also the center of Bonaire's wind surfing activity. 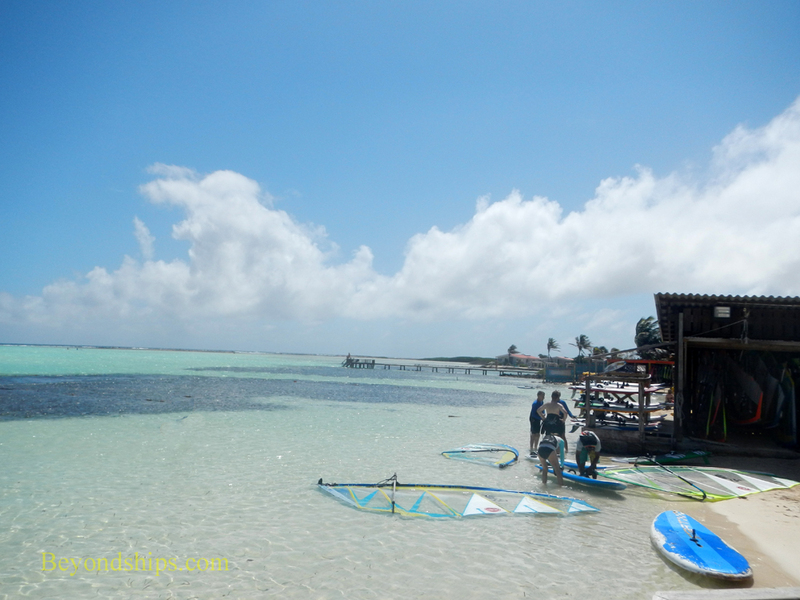 One of the things Bonaire is known for is world class windsurfing and this is its epicenter. No Name Beach is on the neighboring uninhabited island of Klein Bonaire. The beach is a long stretch of white sand. It is undeveloped and peaceful. Also, it is known for its close to shore snorkeling. 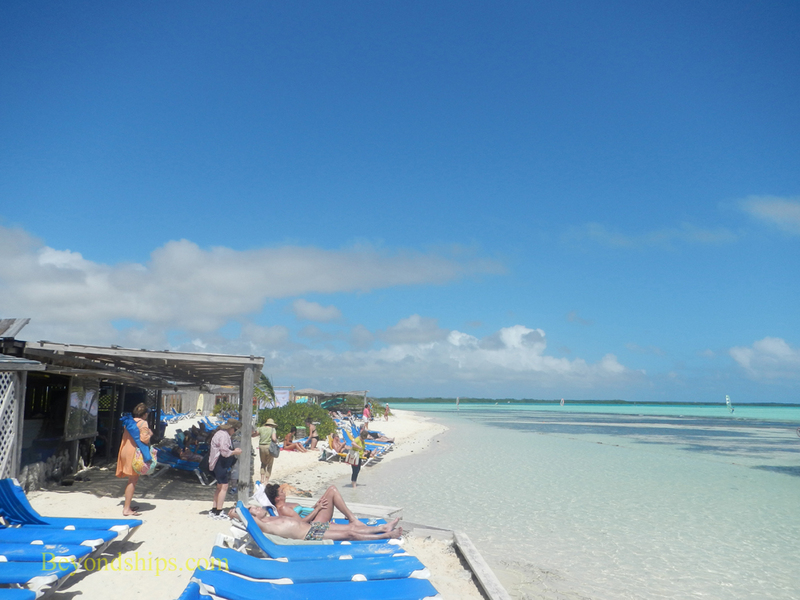 You have to take a boat or water taxi to get to Klein Bonaire. Flamingo Beach is within walking distance of the cruise piers. It has a beach and a pier with a restaurant. Further south by the airport are Donkey Beach (Playa di Mangel) and Te Amo. In the opposite direction, day passes can be purchased for the private Harbour Village Resort. Nearby Eden Beach is free and open to the public. You will need a taxi to get to these beaches. Above and below: Soroban Beach.